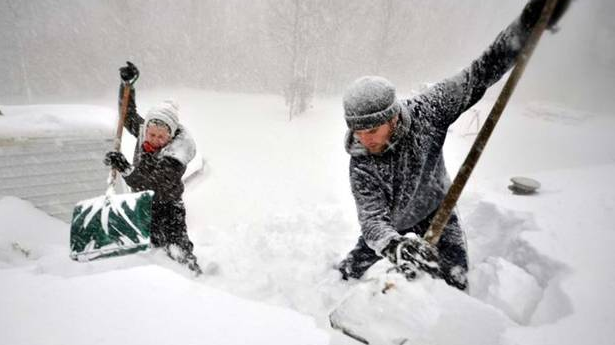 WESTERN residents of New York State are reeling after another two feet of snow fell, placing further strain on the state's already buckling resources as the death toll rose to 10 this morning. The United States has seen a year's snow fall in three days in the New York county area with temperatures dipping below freezing in all 50 states - including Hawaii. It is believed that at least ten people have lost their lives as a result of the unseasonably cold weather, with care homes evacuated in the Buffalo area and the National Football League moving a scheduled game from the local stadium to Detroit. The latest snowfall adds to an estimated five feet already on the ground and meteorologists warned that western residents of New York could expect another 30 inches in the coming hours, with snow and below freezing temperatures expected to continue until midday Friday, according to the National Weather Service. It is believed the freezing weather is the result of a sharp southward dip in the jet stream that has pulled cold air down from the Artic. The phenomenon, known as a "polar vortex", has been enhanced in Buffalo - one of the worst affected areas - by the "lake effect", as warm air off nearby Lake Erie has reacted with the drastically cooler air to produce huge snowfalls. "This is western New York; we're used to it," Jack Fasanella, an Erie County resident, told The New York Times. "But this is the worst I've ever seen. Even worse than the blizzard of '77." The 1977 blizzard killed 23 people in western New York and five more in the north of the state. National forecasters recorded daily peak wind gusts of 46 to 69 mph and up to eight feet of snowfall over a three day period at the end of January. States of emergency have been declared in 10 counties as rescue crews mobilise across the nation to provide much needed help to trapped residents. Erie County Deputy Executive Richard Tobe warned that roof collapses posed a threat, especially at mobile home parks. Nearly 180 elderly residents were evacuated from a care home earlier in the week, after careers noticed the ceiling bulging from the weight of snow. "With this heavy snow load now, there are buildings that are in danger," Mr Tobe said.